Fairmont Copley Plaza has been a landmark in Boston's historic Back Bay since 1912. Constructed on the original site of Boston's Museum of Fine Arts, the hotel derives its name from the great American painter John Singleton Copley (1738-1774). The hotel's architect, Henry Janeway Hardenbergh, combined French and Venetian Renaissance influences on the building's facade. Since he also designed The Plaza Hotel in New York, he included a double "P" monogram along the building's exterior, in the ballroom and on doorknobs throughout the hotel. Inside, gilded, coffered ceilings decorated with trompe l'oeil paintings soar over the grand, 5,000-square-foot lobby and period antiques are displayed throughout, with particular detailing that reinforces Fairmont Copley Plaza's distinctive, refined character. A $34 million renovation and restoration project has updated each sumptuous guest room with modern amenities, adding seventeen suites, complete with antiques and artwork to give each suite an authentic feel of Bean Town. 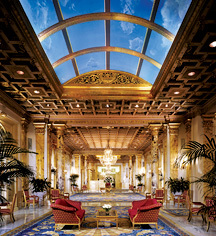 And then there's the lap of Boston luxury: Fairmont Copley Plaza's Fairmont Gold--an exclusive hotel within the hotel located on the entire fourth floor of the building to deliver the highest level of service to the most discerning travelers. 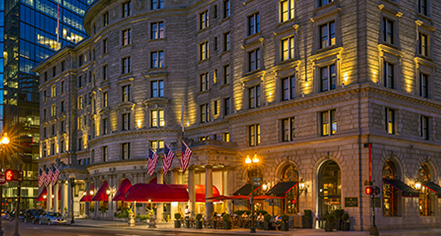 Fairmont Copley Plaza, a member of Historic Hotels Worldwide since 2013, dates back to 1912. Fairmont Copley Plaza and its sister hotel, The Plaza in New York City, share the distinctive double "P" monogram, found throughout both hotels. Cancellation Policy: The standarad cancellation policy is 24 hours prior to check-in (3 p.m.). Cancelling withing 24 ours incurs a one night room and tax fee. Deposit: Charged upon check-in, unless booking through Fairmont Savers where charged at time of booking. Extra Person Fees: Extra-person charges apply ($30). Parking: Self-parking: Available nearby at the following locations (subject to change): 500 Boylston Street: $37, 100 Huntington Avenue: $35, and 126 Dartmouth Street: $35. Valet parking services: Overnight: $53 USD, Daytime/Evening function: $32 USD, Restaurant: $16 USD (with validation) Late Charge: $16 USD, and Late Charge Time: 2:00 p.m.
Payment: All forms of payment are accepted. Payment is required at time of booking. Visa, MasterCard, Amex, Diners Club, JCB, Union Pay, and Discover are accepted. Pet Policy: Service animals allowed: Yes. (Fee exempt). Pets allowed: Yes. Fee: $25 per night. Other: For individuals who are not able to travel with their pet, the hotel offers the services of Carly Copley, Canine Ambassador. Dog: Ambassador: Carly Copley. Transportation: Transportation, including car rental and limousine, may be arranged through the concierge; rates apply. Fairmont Copley Plaza has been a landmark in Boston's historic Back Bay since 1912. Constructed on the original site of Boston's Museum of Fine Arts, the hotel derives its name from the great American painter John Singleton Copley (1738-1774). Learn more about the History of Fairmont Copley Plaza .